The global market for negative pressure wound therapy (NPWT) devices and dressings is all set to exhibit impressive growth over the next decade. During a 10-year forecast period 2017-2027, the global sales of NPWT devices and dressings are likely to expand at a healthy CAGR of 7.1%. The market value for 2017 was US$ 1991.5 Mn, which is expected to reach beyond a value of US$ 3963 Mn by the end of 2027. Rising prevalence of acute and chronic disorders worldwide is prominently driving the demand for NPWT devices and dressings. In addition, increasing popularity of home healthcare settings and surging demand for NPWT in the new age lifestyle will continue to foster the growth of market in the next few years. As far as product type is concerned, NPWT dressing kits segment is found to be a major market shareholder than NPWT devices. On the other hand, hospitals register the largest market value share in terms of end-user segmentation, and home care settings are identified to be the most lucrative end-user segment in near future. Regional segmentation of the market shows North America’s predominance and aggressive emergence of the market in Asian Pacific rim. Product innovation with interesting features, expanding product portfolio presented by key companies, and growing inclination of consumers as well as healthcare providers towards minimally invasive therapeutic modality are expected to collectively push the NPWT devices and dressings market up through to 2027. North America is a mature market owing to substantial penetration of NPWT devices and is presumed to remain the global leader in terms of revenue contribution. (Foam) Dressing kits and home care settings are anticipated to be the largest segments in this region on the basis of product type and end-users respectively. Constant innovation by manufacturers will continue to lure investors in the North American market, especially the US, which is foreseen to be the most lucrative region for investors. Favorable reimbursement scenario created by Medicare and Medicaid services is likely to spur the demand for NPWT devices in near future. Growing availability of cost-effective NPWT devices is also seen to be an important factor boosting the adoption North America. 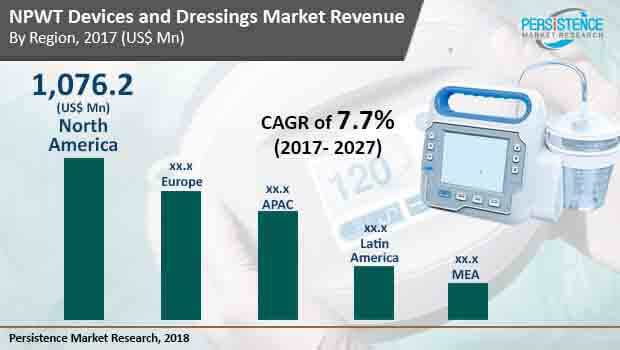 The NPWT devices and dressings market in North America accounted for the largest revenue share of around 54% in 2017. The revenues are expected to register a CAGR of 7.2% during the forecast period. APAC is looked at as the fastest growing regional market at an estimated CAGR of 7.7% over the forecast period. Soaring prevalence of diabetes further increasing the instances of diabetic foot ulcers will reportedly drive the demand for NPWT devices and dressings in the APAC market in near future. China and Japan have been the early adopters of NPWT devices and dressings. In 2017, China NPWT devices and dressings market accounted for over 44% value share in the overall Asia Pacific market, attributed to vast diabetic patient population. India, with over 15% share of the APAC revenues in 2017, is expected to thrive at a robust pace by 2027 end. Australia and Japan are the highest spending countries when it comes to healthcare, followed by Singapore and China. While China and India are slated for robust CAGRs of above 8%, that of Japan and ANZ are estimated to be over 7% over the projection period. According to NCBI, Asian countries contribute to about more than 60% of the world’s diabetic population as the prevalence of diabetes is increasing in these countries, predominantly in Japan, China, and India. This factor plays a crucial role in fueling the demand for NPWT dressing kits and devices within Asia Pacific. Other factors boosting APAC’s NPWT devices and dressings market include soaring demand for portable devices and rapidly growing popularity of home care settings. However, unawareness still persists in in some parts of APAC, which is seen to be a longstanding challenge to market growth. Moreover, inadequacy of reimbursement policies and promising introduction of alternative, FDA-approved parallel therapies such as HBOT and TOT will possibly continue to pose a challenge to market growth in this region.